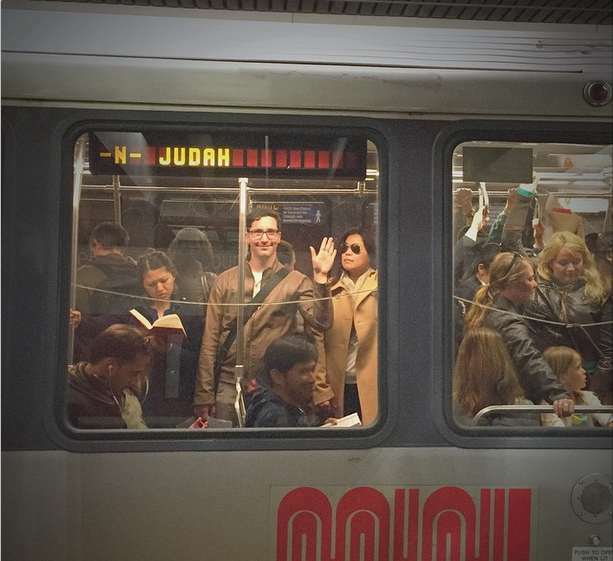 N-Judah rider Rachel was framing that perfect candid Instagram photo on the Muni platform (you know, rule of thirds in a perfect square, yada yada) when this guy in the train decided to wave hello. Our hearts stopped because this is just the kind of dorky cute gesture that romcoms should be made of. Missed Connection: We locked eyes at Powell Station last week as I attempted to take an Instagram-worthy picture of the crowded N-Judah. You photo-bombed my candid and I blushed. You could have been my best friend. We could have shared a pizza or laughed about old times over IPAs or discussed House Of Cards or gone to Fort Funston. But now all we have is this cropped memory. Dear photobomber, who are you? Join us at Muni Diaries Live on Saturday, April 18, for a night of true, hilarious, weird, and sweet stories that can only happen on Muni! Grab a ticket and we’ll see you there! Come on, Interwebz! You can do it!